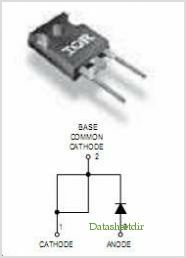 These Diodes 60EPU02PbF 60APU02PBF are optimized to reduce losses and EMI RFI in high frequency power conditioning systems. The softness of the recovery eliminates the need for a snubber in most applications. These devices are ideally suited for HF welding, power converters and other applications where switching losses are not significant portion of the total losses. By International Rectifier Corp. This is one package pinout of 60APU02PBF,If you need more pinouts please download 60APU02PBF's pdf datasheet. 60APU02PBF circuits will be updated soon..., now you can download the pdf datasheet to check the circuits!